Lewis Edmunds was the second son born to Thomas and Mary Edmunds (nee Morgan). Both were born around 1847, Thomas in Gelligaer and Mary in the Llanfabon area. In 1881 the family are shown as living at Collier’s Cottages, Nelson, which is where they were living when Lewis and his brother William were born. 9, Heol Fawr, Nelson, Glamorgan. (Heol Fawr is the correct Welsh name for the street that has by now become more commonly known as Long Row.) Mary is shown as being a widow. Mary Jane Edmunds - born ~do~, around 1889. Before war broke out, Lewis was a coal miner, as were his brothers, William and John. Richard on the other hand appeared not to want to go into the coal mining industry and learnt to become a cobbler/ boot maker. All the family were bi-lingual, speaking Welsh and English. Thomas Edmunds, born around 1908 and shown as grandson to Mary. On the 1911 census report, Mary is shown as having given birth to seven children in all, two having been born alive, but died later. Though Mary has a grandchild, Thomas, all her five children are shown as ‘single’ and Mary Jane has retained her ‘Edmunds’ family name, but is shown as having had one child that is still living. 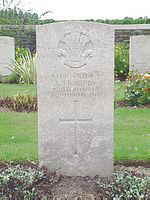 Another Nelson soldier has been killed in action in France on 8th January 1916, this bringing the total of Nelson fallen heroes up to 7. This latest victim is Private Lewis Edmunds, 30491, 10th Service Battalion, Welsh Regiment, whose homes was in Station Terrace. He was shot by a sniper whilst leaving the trenches, his eldest brother Private William Edmunds, Welsh Regiment has been wounded and is now a Prisoner of War in Germany.